Take Five is a classic jazz standard that many guitarists learn at one time or another in their development. But, while it can seem like a straight-forward progression that only uses two chords, creating a memorable solo over this tune is tougher than it seems. To help you solo over Take Five, and learn more about the soloing techniques of one of jazz’s greatest improvisers, here are five classic Paul Desmond licks that you can add to your repertoire. Not only will these lines help you navigate the Take Five chords, but you will also get into the mind of a jazz sax legend at the same time. 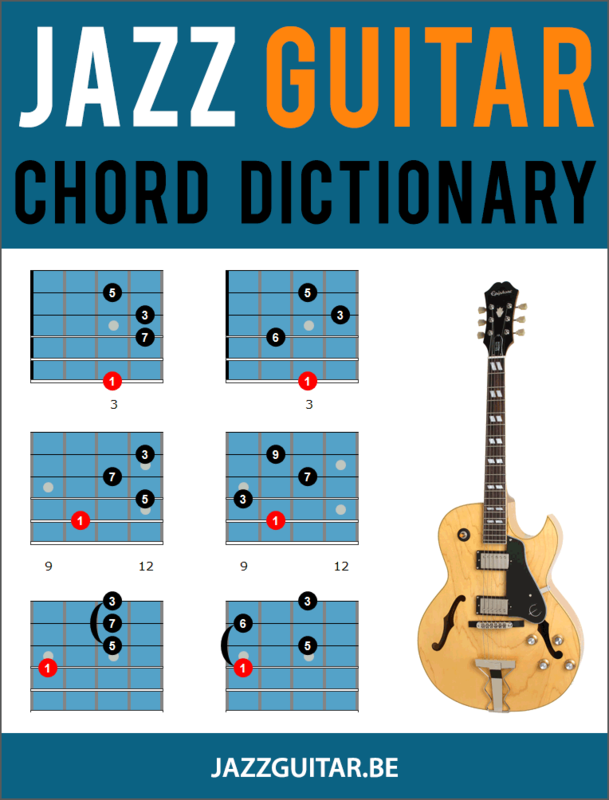 Each lick is broken down so you can understand the material behind the lick, allowing you to add these lines to your vocabulary and increase your understanding of jazz improvisation at the same time. All licks in this lesson make use of the Eb Dorian mode. The Eb Dorian scale comes from the parent key of Db major, as Dorian is the second mode of Db. This means that when you play Eb Dorian, you are playing all the notes of the Db major scale, but starting from Eb rather than Db. The first lick features a few nice leaps, such as the Bb to Eb in the first bar, as well as Paul Desmond’s characteristic use of space in the line. This use of space is a part of the “Cool Jazz” sound that Desmond was famous for, and it helped define his voice on the instrument. In this Paul Desmond lick, you’ll see a line played in both bars, with a different ending for that lick in each measure. This is a common jazz phrasing technique found in the solos of many great players, most notably Wes Montgomery on the guitar. Here, you play the same phrase in the first half of both bars but then resolve that phrase differently in each bar. This allows you to use the same line in two measures and not sound repetitive, it’s about developing the idea rather than repeating it exactly. In this lick, you’ll notice the use of the Ab triad over Ebm in the second measure. When playing over minor or m7 chords, such as Ebm in this tune, you can use the related V or V7 chord to create color in your lines. This means that if you are in the key of Db major, the iim chord is Ebm and the V chord is Ab. By playing the V chord over the iim chord, you highlight the 11, 13, and root notes of the underlying chord. This is a cool way to spice up your lines without doing anything more complicated than playing a diatonic triad in your lines. 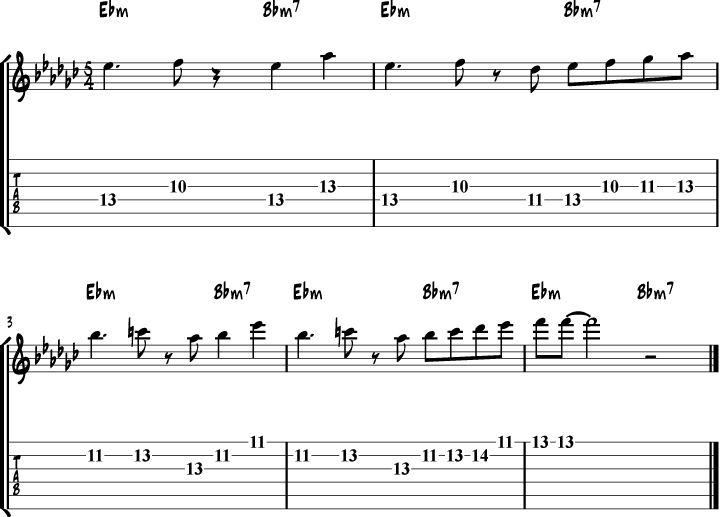 This is a “slow burner” lick, one that starts of slow and then picks up the pace as you move through the five-bar phrase. By approaching the line this way, Desmond used space in the beginning, with fewer notes, as he builds intensity and increases the note volume by the end of the line. When soloing over longer phrases, such as this five-bar line, try working your solos in this fashion. Starting slow and building momentum is not only an effective way to mix up your phrasing, but it will also create energy and forward motion in your lines at the same time. In this final lick, you see another example of Desmond starting each bar with the same material, while the second half of the bar end differently each time. As you can see, in this phrase he does this over a four-bar span, much longer than the examples you saw previously. In order to recreate a line like this in your playing, you’ll have to be able to keep the melodic idea at the start of the bar in your ears and memory. To do this, practice repeating small musical motives in your solos, which will help you work on keeping those ideas in your playing, coming back to them time and again as you develop them throughout your solo. Take Five was written by alto saxophonist Paul Desmond and performed by The Dave Brubeck Quartet on the album Time Out (1959). In 1961 it became the biggest-selling jazz single ever. Take Five was one of the first jazz compositions with a time signature other than 4/4 or 3/4. The single is a different recording than the LP version, most of the drum solo is omitted. The performance royalties of Take 5 (and all other Paul Desmond compositions) go to the American Red Cross. I’ve been playing this song for close to 30 years. It’s just one of those songs that never gets stale. Thank you. This is one of my favorite tunes. Thanks Dirk. This is an old favourite of mine, and a very useful article from you. I think that Paul Desmond is somewhat underrated by many. For me, I know of no other alto sax player that produces such a sweet and mellow tone. Many great sax players, to my mind, err on the side of sounding a little too brash! This is really helpful. I am struggling with jazz guitar in general and this gives me a really solid basis to work on. Thanks very much. Where’s that confounded bridge? This song has more than two chords. The bridge is fairly tricky (timing) and to me is the essence of the song. So is the melody that is not that easy to play in Ebm position but lots of fun to get down. Thanks for the work, it is much appreciated. Is this key signature G flat? Thanks! Hi Phil, Take Five is in Eb minor (the relative minor of Gb major). If Take 5 is in Eb Dorian (2nd mode of Db) then why is the key sig in all the Real Books six flats (Gb) instead of 5 flats (Db)? That would be Eb natural minor, not Dorian. I’m confused. There are also a few Eb minor pentatonic licks,e.g. the theme!